The Jaguar X-TYPE gets a fresh look for 2008, along with a host of new features inside and outside the vehicle and a new automatic transmission in the acclaimed 2.2 diesel. With significant revisions including nearly 500 new components, the new generation X-TYPE retains all the original car’s strengths, and adds some new ones of its own. "The new X-TYPE stands for accessibility, versatility, luxury and choice within the Jaguar range", explained CJ O'Donnell, Global Marketing Director, Jaguar Cars. "The package of revisions – particularly the automatic transmission in the 2.2 diesel – presents our established dealers and the key emerging markets with an excellent opportunity to reach new customers and retain existing owners." The new X-TYPE's exterior styling is significantly refreshed - with changes that reflect some of Jaguar’s new saloon car design language - with subtle interior revisions and greater choice of trim and equipment, further emphasising the X-TYPE's premium car credentials. For the first time in this model range, the new X-TYPE now offers the combination of diesel power with automatic transmission – pairing the 2.2 litre diesel with a six-speed automatic, and the one-touch control of Jaguar Sequential Shift – broadening the new model’s appeal to buyers who previously could not have this combination in an X-TYPE. The new X-TYPE automatic diesel combines high levels of refinement with optimised performance and economy, and promises more choice and even greater luxury, to appeal especially to a younger, more family-orientated audience. With major revisions including nearly 500 new components, the new X-TYPE retains all the original car’s strengths, and adds some new ones of its own. 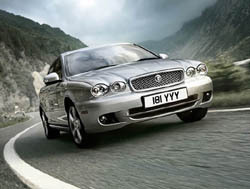 The X-TYPE's exterior styling is significantly refreshed, with changes that give it greater visual strength and appeal. The new X-TYPE also has subtle interior revisions that give more choice of trim and equipment, to further emphasise its luxury car credentials. For the first time, X-TYPE buyers can choose diesel power with automatic transmission, including one-touch Jaguar Sequential Shift – broadening the new model’s appeal to those who previously would have ruled out X-TYPE purchase. The 2.2D manual version has headline figures of 0-60mph in 8.7 seconds, a maximum speed of 134mph (216kph), a combined economy of 47.1mpg (6.0l/100km), and a CO2 rating of 159g/km. The respective figures for the 2.2D automatic are 9.5 seconds, 129mph (208kph), 41 mpg (6.9l/100km) and 184g/km. The comparative figures are similar for Estate versions. The X-TYPE 2.2 Diesel automatic combines a powerful, advanced diesel engine with a proven luxury vehicle – the result is an exceptional blend of performance and refinement. Saloon and estate versions of the new X-TYPE go on sale in the UK in March 2008 and in other European markets from April 2008. The diesel-automatic alternative For the first time in the X-TYPE range, buyers can opt for diesel power and an automatic transmission. The 2.2 litre diesel is paired with a new six-speed automatic gearbox, which has the added attraction of 'one-touch control' Jaguar Sequential Shift, for manual gearchanges. "The combination of diesel power with automatic transmission and Jaguar Sequential Shift adds yet another dimension to the X-TYPE", commented X-TYPE Chief Programme Engineer, Kevin Stride. "Furthermore, all the actions we have implemented on the new car improve its refinement and drivability". The six gear ratios are chosen to deliver refined cruising while maintaining sporty performance – the balance that Jaguar research shows an X-TYPE owner wants. Where the 2.2 litre diesel with manual transmission can achieve maximum torque from second gear, the new combination can achieve maximum torque in all six gears, utilising optimum gear change points to ensure best use of the available torque. This delivers significant benefits to performance 'feel' and the performance of the diesel automatic is impressively close to that of the diesel with the manual transmission. In the new X-TYPE saloon, the 2.2D manual version has headline figures of 0-60mph in 8.7 seconds (0-100kph in 9.1 seconds), a maximum speed of 134mph (216kph), a combined economy of 47.1mpg (6.0l/100km), and a CO2 rating of 159g/km. The respective figures for the 2.2D automatic are 9.5 seconds (9.9 seconds), 129mph (208kph), 41 mpg (6.9l/100km) and 184g/km. The comparative figures – shown in full in the specification tables - are similar for estate versions. Thanks to the new transmission’s advanced electronic control, it offers rapid responses to shift commands, and a choice of operating modes. Moving from fully automatic to ‘manual’ mode automatically selects a ‘Sports’ setting: this delivers more involving, sporty shift dynamics – with the added benefit of simple, one-touch up- or down-shifts using the Jaguar Sequential Shift programme. As well as the changes needed to install the new transmission, extensive measures were taken to optimise cooling, weight and noise, and vibration and harshness (NVH) characteristics. These include at a physical level, a greater volume of and improvements to sound insulation materials, while in the electronic arena the Engine Speed Control (ESC) smoothes downshifts and the torque converter is given a degree of slip that both improves its NVH qualities and gives improved drivability and economy. Technology moving forwards The new X-TYPE also introduces significantly upgraded electronic features, from new digital audio options to improved Bluetooth® connectivity and ‘Generation 5’ parking aids. As digital broadcasting becomes increasingly widespread around the world, the new X-TYPE offers Digital Audio Broadcasting (DAB) systems, while retaining the ability to receive both analogue and digital broadcasts. The new Bluetooth® Phase 2 system offers the ability to pair as many as five different handsets to the car, where the earlier system offered only a single pairing. It also offers extended phonebook functions, including last-number redial for each of the five paired handsets if needed, and enhanced connection strategies, including the last paired handset connecting first on starting up again. And rear park aids now match the front ones in being ‘Generation 5’, using new technology that allows the sensors to be smaller, neater and body coloured. Building on its strengths The new X-TYPE announces its arrival with a fresh new look that reflects Jaguar’s new design language. The exterior surfaces are clean, confident and above all, contemporary, visually confirming the new X-TYPE as a thoroughly modern Jaguar. The frontal styling introduces a new ‘3D’ bright mesh grille, with a bold frame and body coloured outer surround that echo the design themes of both the XJ and XF. And the new X-TYPE is proud of its Jaguar identity, with a new Jaguar ‘growler’ emblem prominently mounted within the mesh grille. New front bumper covers define the new X-TYPE’s face, with taut, clean lines and neatly integrated side marker reflectors. A bright ‘splitter’ in the lower air intakes also adds visual width to the new X-TYPE, while the front bumper neatly incorporates colour-keyed sensors for the next-generation park-aid system and re-profiled covers for the headlamp power-wash system where those features are fitted. The redesigned rear bumper continues the clean, confident theme, with smooth, simple surfaces that shrink the visual mass of the rear of the car. Echoing the bright splitter in the front, a full-width bright chrome signature blade gives the new X-TYPE a strong identity in line with the rest of the Jaguar range. In another neat touch, a new roof-mounted Antenna Pod for saloon and Estate replaces the previous aerial. In profile, new sill shapes connect the re-styled front and rear bumpers and visually lower the new X-TYPE’s centre of gravity, giving it a more purposeful, sporting stance. The lower, sportier profile is underlined by cleaner, more modern side mouldings, while replacing the side indicator repeaters with bold new Jaguar ‘ingot’ badges adds a striking piece of jewellery to the front fenders – very much in line with new Jaguar design. The Sport pack also offers a subtle body-coloured rear boot-lid spoiler. The new door mirrors offer maximum functionality (including the options of memory settings and power foldback), and are either body-colour or - in some markets – have chrome highlights. They also include integrated side repeaters - again, a feature common to the new XJ and new XF. The strong new growler grille badge clearly identifies the X-TYPE as a Jaguar, and there is a new script style for the X-TYPE badge. High-specification models are appropriately identified by an Executive or Sovereign badge, but aside from this, simplicity is the key with the all-wheel drive, AWD badges and engine identifier badges seen on the previous generation X-TYPE deleted, for a cleaner look. Completing the external visual changes, the new X-TYPE introduces two new five-spoke alloy wheel styles – the 17-inch Barbados and 18-inch Abaco – while the exterior colour palette ranges from Porcelain White to the new Ultimate Black, with Pearl Grey, Glacier Blue, Chilli, Winter Gold, Liquid Silver and Emerald Fire among the other choices. The inside story The interior freshening of the new X-TYPE complements the exterior changes, focussing on contemporary Jaguar design, but with familiar levels of comfort, luxury and craftsmanship. The new X-TYPE introduces four new seat styles, each with its own matching door trim. One has leather borders with sport cloth centre cushions, and bold new horizontal twin-needle stitching – complemented by door trim pads matching the two seat trim colours, Champagne or Warm Charcoal. Those seats also have electrical four-way adjustment, for both driver and front passenger. A second option offers either six-way or ten-way driver and passenger seat adjustment (market dependent), all leather seat facings with twin needle horizontal stitch, and door trims in seat trim colour with a three-diagonal twin-needle stitching pattern – with the additional choice of Ivory colour. Customers wanting a sportier interior trim can choose the Sports Pack. In soft grain leather with twin-needle diamond stitching for the centre cushions, in contrasting colours – Warm Charcoal leather with Stone stitching, Ivory or Spice with Warm Charcoal - the Sports Pack seats have ten-way adjustment with driver’s seat memory function, and the luxurious diamond-stitching pattern repeated in the matched door trims. The range-topping Luxury Pack also offers ten-way adjustment, with memory, plus a subtly different all-leather style, combining horizontal stitching and contrasting piping – Champagne leather with Warm Charcoal piping (or vice versa), and Ivory leather with piping in another new colour, Oyster. The Luxury door trim matches the seats, but adds traditional walnut inserts. A dark, distinctively-grained Rosewood veneer is a new option with a fresh, contemporary design feel, and depending on model includes the automatic shift surround and ashtray lid. Piano Black is a modern, stylish and luxurious option that is often seen as an expensive option on some rivals, but which comes as standard as the facia highlights on the opening trim level for the new X-TYPE. These same models also include a Charcoal leather gearknob on manual versions, Piano Black shift knob and surround on petrol automatic versions, and leather with Piano Black inserts for the new diesel automatic combination. Other trim levels offer combinations of leather, Rosewood veneer or Piano Black, while the Sports Pack includes Carbon Fibre highlights, and the Luxury Pack has Walnut veneer for the facia, gearknob, steering wheel and door trims as described. Depending on model, facia colours are Warm Charcoal or Oyster, and carpet colours are Oyster, Flint or Champagne. The premium feel of the new X-TYPE is enhanced by new details. Those include a new Tungsten metallic finish for the air vents, manual gearshift surround, ashtray (or storage for non-smokers), centre stack bezels, steering wheel switch bezels and master light switch. There is chrome edging for steering wheel and air-vent thumb-wheel controls, a new steering wheel growler badge, and new headlining and pillar trim covering materials. The instrument cluster has a sportier look - similar to that of the new XF - with new silver metallic overlays, new pointer hubs and new bezel shapes, plus a combination of green dial illumination and white pointer illumination, just as in the XK. So in every respect, the new X-TYPE does what the X-TYPE has always done, and moves things on. Once again, it is a Jaguar with broader appeal than ever.